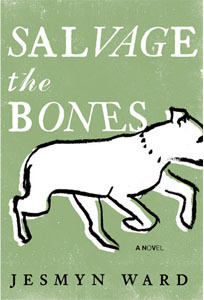 Salvage the Bones by Jesmyn Ward is one of those books that once it comes in the front door, makes itself right at home. At first, I was reluctant to let it in. The cover isn’t intriguing and I don’t always appreciate the same books as the friend who recommended this one. Ward’s book, however, is a winning guest. Literally: it’s the 2011 National Book Award Winner. Fifteen-year-old Esch, her three brothers and frequently-drunk father live in rural coastal Mississippi. The story follows the 12 days leading up to, and including, Hurricane Katrina’s arrival. Despite what appears to be laissez faire parenting, Esch’s father is increasingly concerned about a possible powerful storm making land. In between drinking binges, he tries to ready the family’s ramshackle home. Told from Esch’s point of view, Ward has crafted a beautifully poetic, heartbreaking story of family love, loyalty and misdirected affection. Esch is an intelligent young woman, but she lives without benefit of another woman’s perspective; her mother died seven years earlier. The only other female around is her brother Skeetah’s pit bull, China. The impending hurricane and Skeetah’s concern for China are told as parallel accounts. China, bred for fighting, has just given birth to her first litter. Despite their father’s appeals for help to make the house secure, the kids go about their lives as usual: basketball, swimming and hanging out with friends. Even without the storm’s threat, it becomes quickly evident that all is not as carefree as it appears.